Is there anything better than the smell and taste of freshly baked bread? 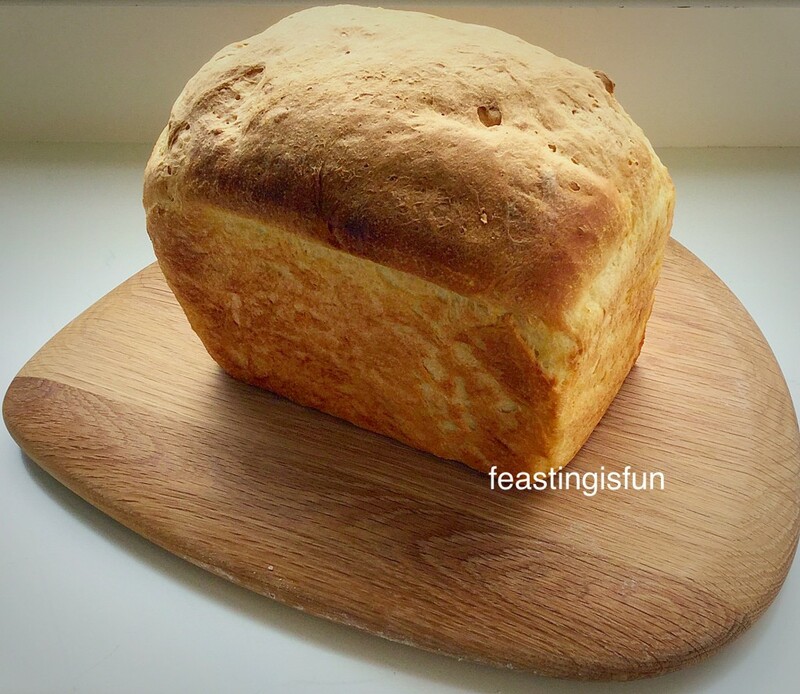 This Farmhouse White Loaf is utterly delicious. 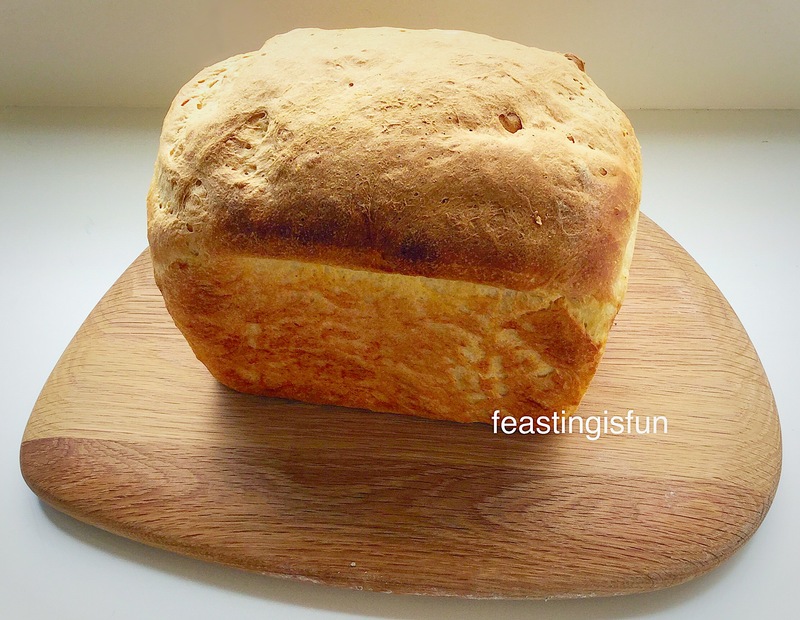 If you’ve never baked bread before, read on and let me encourage you to give it a go. 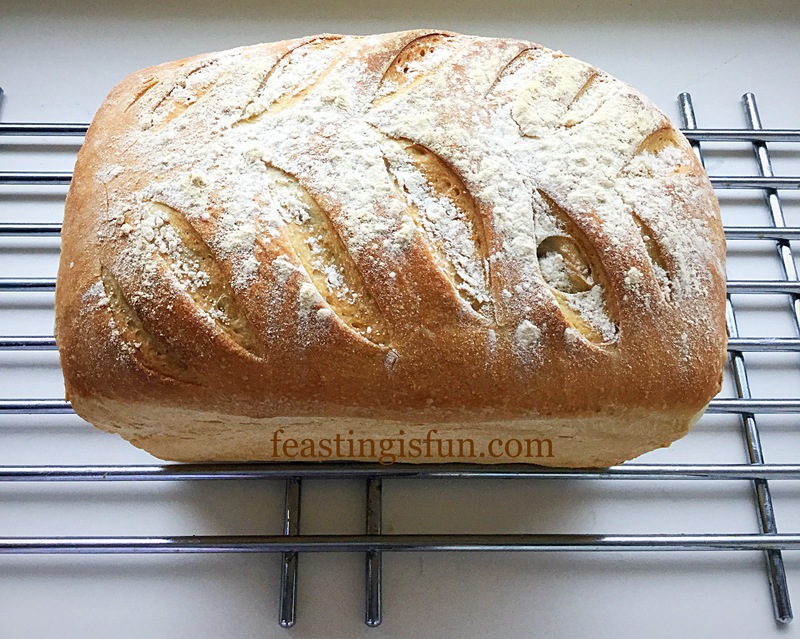 Farmhouse White Loaf, perfect for sandwiches or toast. Baking your own bread is such a rewarding experience. From a few simple ingredients, mixed together, the bread literally grows before your eyes. 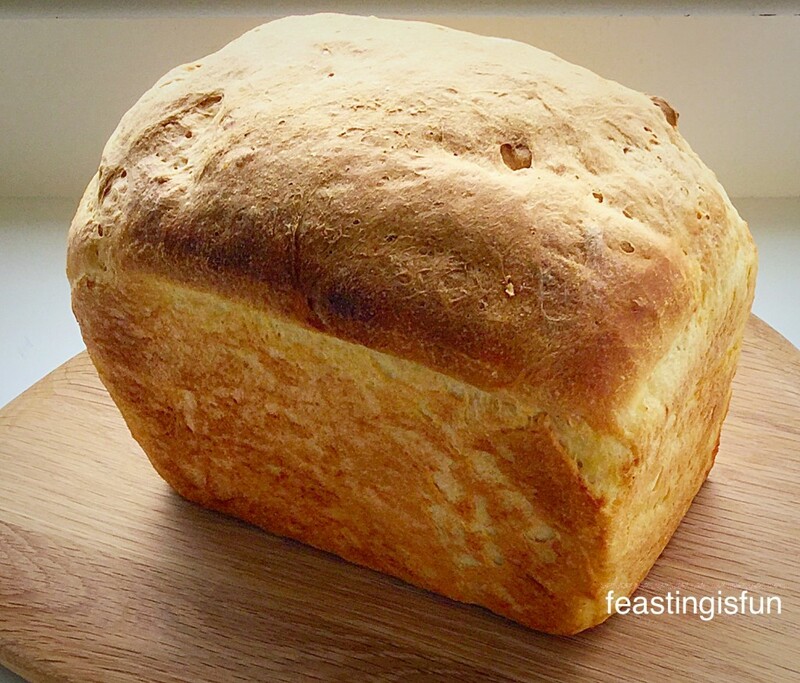 This Farmhouse White Loaf is the perfect recipe to start with, if you have never made your own bread before. You will need a loaf tin to bake your bread in. I recently reviewed a British company, that sells British manufactured bakeware you can read it here. British Bakeware sell a range of loaf tins, my favourite and the one used for baking this loaf is the 3lb deep farmhouse loaf tin. 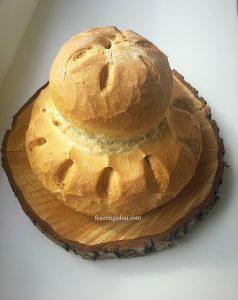 This Farmhouse White Loaf was 16cm high!! The advantage of having a deep loaf tin is, no muffin topped loaves. In the past I have baked bread in tins that weren’t as deep as this one and the bread rose and billowed out, like a mushroom. I’d have to cut away the sides of the bread, where it had stuck to the outside of the tin. Not they way to bake a great looking loaf!! The instructions given below for making this bread are, by hand (which everyone should do at least once in their lifetime), or using a stand mixer/bread maker to carry out the mixing, kneading and knocking back. Personally I prefer bread baked in the oven. I have baked many a loaf in a bread maker, however, I never seem to get the gorgeous, crunchy crust, that I achieve with an oven baked loaf. Plus the bread maker loaf is always a little soft for my liking and you get the inevitable hole, in the bottom of the loaf, where the mixing paddle is! If you like baking bread in a bread maker I am most certainly not going to judge you. Any bread baked at home is infinitely better than plastic wrapped, pre-sliced, mass produced bread! 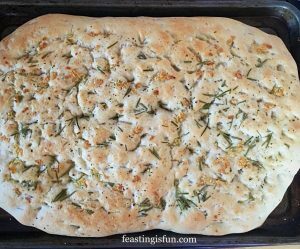 Aside from speciality breads like my Tomato Thyme Garlic Focaccia, bread should contain nothing more than flour, water, yeast, salt, water and a little oil or butter. Read the ingredients on the back of a shop bought loaf and you will be amazed at all the additives. Baking your own bread is easy, once you get into a routine. Even when baking by hand, it still only takes 20 minutes, hands on time, to get a loaf ready to be baked. 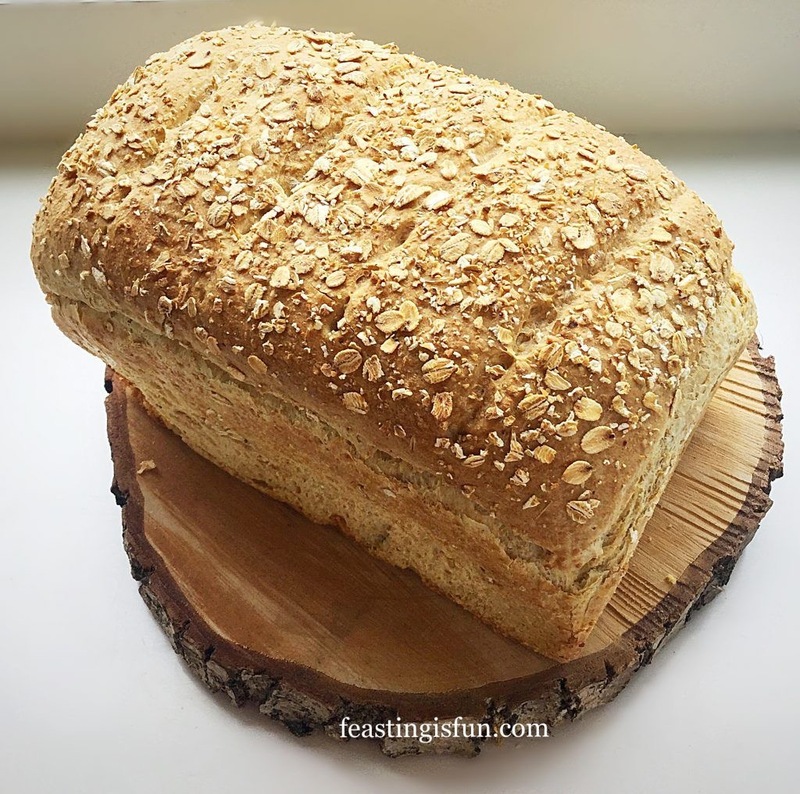 Once you taste real, homemade bread, it’s hard to go back to the bought stuff – that said, I’m a realist and I usually have a bought loaf stashed in the deep freeze for days when my body is playing up (see here). So I won’t judge!! Farmhouse White Loaf – will you give baking bread a try? Just a quick tip: if you do start to bake bread regularly, it can pay to bulk buy your bread flour. I use organic flour that is stone ground, from Shipton Mill currently I buy it through Amazon UK using their subscribe and save, although Shipton Mill now have their own online shop. Buying in bulk, through Amazon UK, 5 x 2.5kg bags, means that we eat good quality, organic, stone ground British flour, for about 60 pence a loaf!!! Whilst I love baking with fresh yeast, the shelf life is very short, so I have used 7g sachets of fast action dried yeast. If you do use fresh, just double the quantity stated for dried. Pour the water into the bowl. Add the honey and yeast. Swish about with clean fingers to activate the yeast. If using a bread maker, set to dough cycle and start the program. Once the cycle is completed re-start for 2 minutes. This ‘knocks back’ the dough. Then remove the dough, shape into an oval/ball and place into a buttered loaf tin. Cover with a damp cloth, leave in a draught free place until doubled in size. If using a stand mixer, attach the dough hook and mix on medium speed until all the ingredients are combined. Continue to mix for a further 5 minutes, until the dough is smooth and elastic. Stop mixing. Scrape the dough from the dough hook and combine with the dough in the bowl. Form into a ball, place back into the bowl. Cover with a damp cloth and leave in a draught free place until doubled in size (approx. 1hour). Once doubled remove the cloth, mix for 2 minutes on medium speed using the dough hook. This ‘knocks back’ the dough. 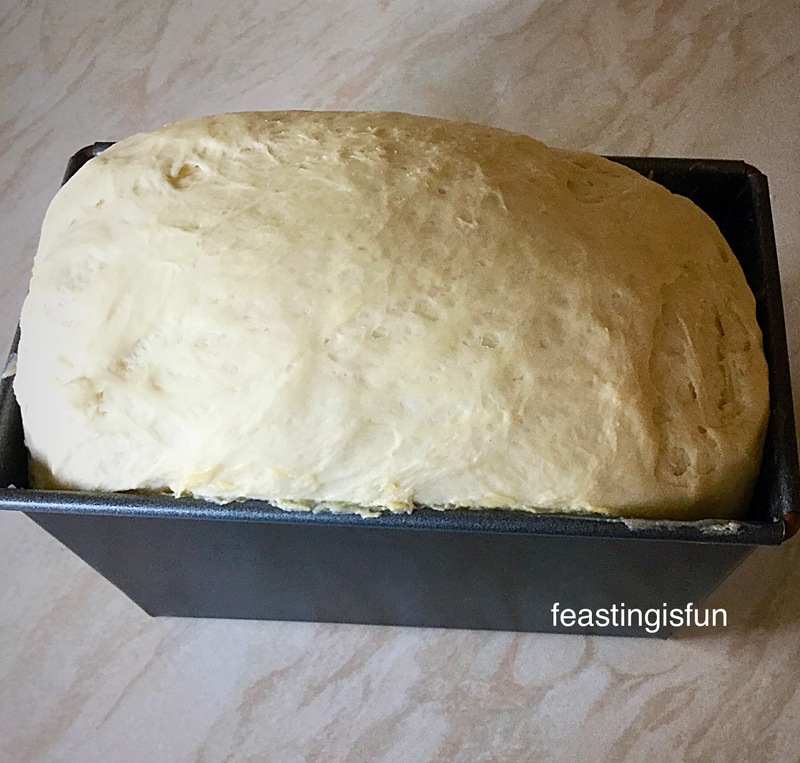 Remove the dough and form into an oval/ball shape, place into a buttered loaf tin. Cover with a damp cloth, leave in a draught free place until doubled in size. If hand mixing, bring all the ingredients together with your hand until they form a doughy mess! Place this dough onto a very lightly floured worktop. Knead for a good 10 minutes. If the dough gets sticky, keep kneading and working it – if you add extra flour the finished bread will be dry. After a good 10 minutes kneading, the dough should have a smooth elasticity. Place the kneaded dough into a buttered bowl, cover with a damp cloth and leave in a draught free place until doubled in size, 1-2 hours. Knock back the dough by gently punching the risen dough. Form the dough into an oval/ball shape, place into a buttered loaf tin. Cover with a damp cloth and leave in a draught free place until doubled in size. Farmhouse White Loaf ready for the oven. 10 minutes before the dough is ready to bake, preheat the oven to 220C/200C fan. Place the loaf tin into the middle of the oven. Bake for 30 – 40 minutes. Enjoy the wonderful aroma of baking bread as it fills your kitchen. That alone is worth baking this bread for! The bread is cooked when it has a deep golden crust and sounds hollow when rapped on the base with your knuckle. Remove the Farmhouse White Loaf from the oven. Tip out the loaf from the tin and leave to cool on a rack. Allow the Farmhouse White Loaf to cool completely before slicing. I know it is sooo tempting to tear into the hot, freshly baked loaf, but if you do the bread will all squidge (is that a word??) together and be very hard to slice. 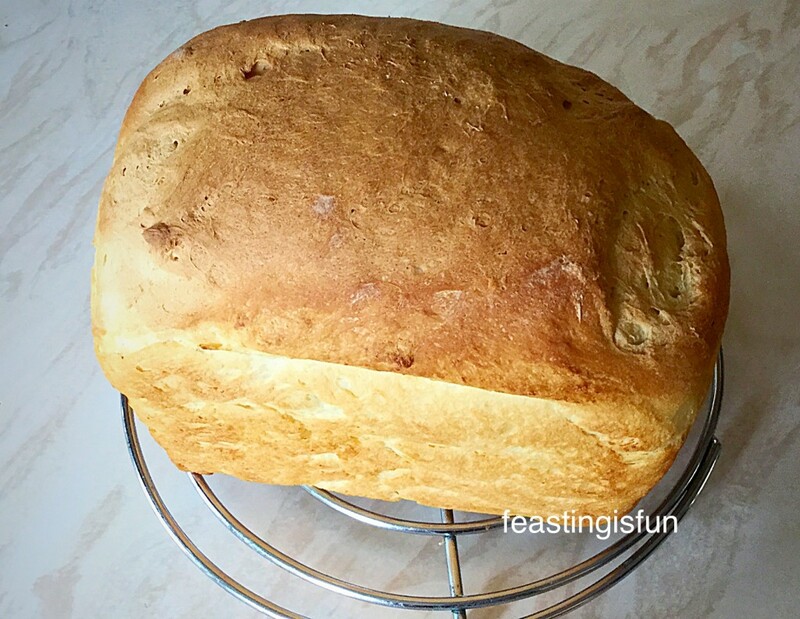 Give yourself a big pat on the back for making a cracking loaf! This was not a sponsored post. All opinions are my own and recommendations for products are purely from my own personal experience. Bread is a staple in so many homes, treat yourself to a home baked loaf and I promise you won’t regret it. A Farmhouse White Loaf slashed after the second prove. I do not presume to be an expert, however, I have baked a fair few loaves over the years. Please ask if you are having any problems, need guidance or reassuring? Either leave a comment or tweet me a question. I will do my very best to help. My Twitter name is @sammiefeasting. Have fun making and baking your own bread and don’t forget to share it! Yum….your farmhouse white loaf sounds just how bread should be – rustic with a nice crust and soft and delicious inside! Thanks for sharing Sammie! 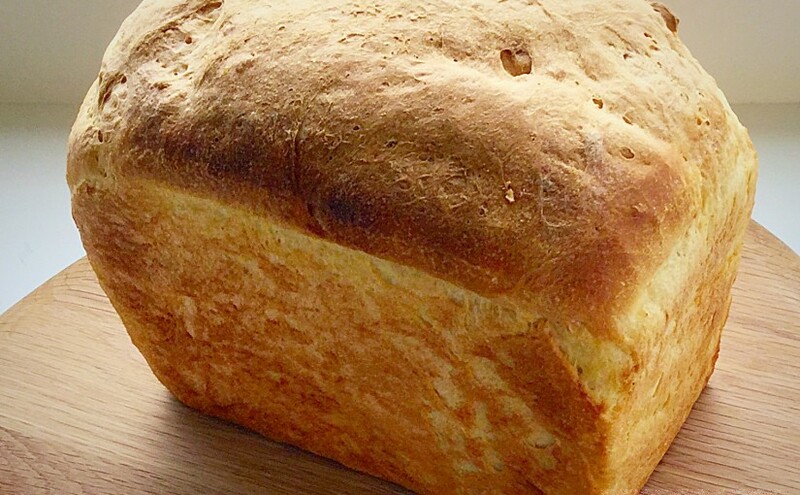 Nothing beats the aroma of freshly baked bread. Or the taste! I’ve just discovered you whilst googling bread recipes for a 4lb tin. Do you think this recipe would work for a tin that large or would I need to increase the quantities?